The Indigenous Communities of Nicaragua have persisted and many of their roots and origins are part of a mix between Spanish, English, African and Indigenous cultures. Therefore, a syncretism, understood today as ancestral legacies, have emerged and are demonstrated in traditional dances, autoctonal music, gastronomy, believes and religion, unique in each Indigenous community of the country. In Nicaragua are established Indigenous communities on the Pacific, Center, North and Caribbean part of the country. As well, ethnics with Afro-Caribbean lineage such as Creoles and Garífunas can be found. The Creoles and Garífunas are recognized by the Political Constitution as ethnic communities, according to Julio César Ruiz, Coordinador Componente de Áreas Protegidas del Gobierno Rama-Kriol (Coordinator of the Protected Areas of the Rama-Kriol Government). These groups are known for sharing an equal ethnic conscious, which allow them to preserve their culture, values and traditions related to their cultural roots, forms of possession and manage of land and nature resources. Despite of the material exposed on this special, the Afro-descendent communities will not be mentioned since the principal topic in our work are the Indigenous communities. Nowadays, 8.6% of the total of the country's population self-identifies as resident of one specified Indigenous or ethnic community. Such official data was obtained from the VIII Censo de Población en Nicaragua ( VIII Population Census in Nicaragua), made in 2005 by the National Institute of Statistics and Census. The information regarding the census can be consulted through this document. On the following paragraphs are presented in two segments the Indigenous communities of Nicaragua. The communities from the Pacific, Center and North of Nicaragua will be presented first, and secondly, the North Atlantic Region (RAAN) and South Atlantic Region (RAAS) communities. According to the baseline study about life conditions of the Pacífico, Norte y Centro de Nicaragua de la Oficina Internacional del Trabajo (OIT) (Indigenous Communities of the Pacific, North and Center of Nicaragua of the International Bureau of Work (OIT)), the current population of the American native lineage established on the Pacific, Center and North of Nicaragua (not included the Caribbean nor the South regions) is composed by 22 indigenous communities located in the departments of Rivas, Masaya, León, Chinandega, Matagalpa, Jinotega, Nueva Segovia and Madriz. 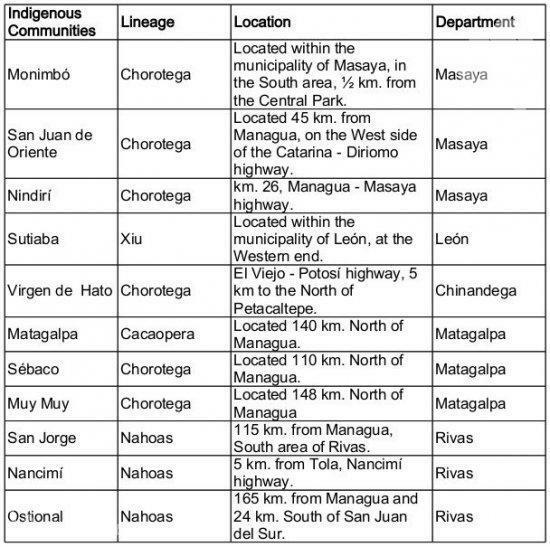 The people who conform these 22 Indigenous communities belong to the Chorotega, Cacaoperas, Xiu and Nahoas lineage. For better understanding, in the following table is displayed the gathered information identified in the Baseline Study concerning to life conditions of the Indigenous Communities of the Pacífico, Norte y Centro de Nicaragua de la OIT (Pacific, North and Center of Nicaragua of OIT). The transculturation suffered by the Indigenous Communities of the Pacific, Center and North regions restructured, in a certain way, the life form of the inhabitants. According to Justo Felipe Ruiz, Coordinator of the Indigenous Communities of the Pacific, Center and North Council of Nicaragua in 2013, the social structure was not changed, even though the mother tongue was certainly replaced. Each one of these groups still preserve their traditions and ancestral authorities as the council of elders or Monéxicos and Varas mayors. Today, the 22 Indigenous Communities of these 3 regions of Nicaragua are gathered in a council denominated Indigenous Communities Council of PCN, which is the highest representative member of the Indigenous in these areas. 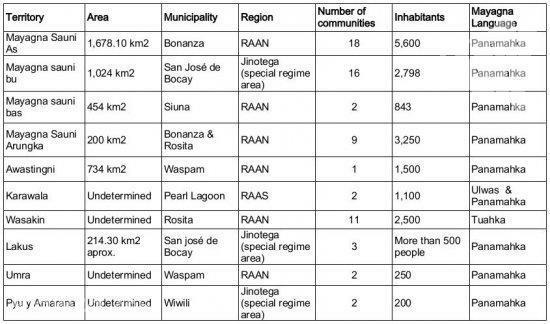 Such towns coalition works in a Law Draft, known as “Autonomy Law of the Indigenous Communities of PCN”. It’s main objective is to support the protection of the Indigenous communal lands, respect their ancestral authorities and promote the self determination as well as the preservation of their customs and traditions. Right now, the most perceived problems are the mismanagement and dispossession of communal lands. This situation has created divisions between community leaders due to the economic resources involved. Another identified issue is the struggle for authority among leaders to control the communal goods. This matter affects the Indigenous communities of Sutiaba, Sébaco, Monimbó and others. The circumstances mentioned have pushed the Indigenous Communities Council to create a census about Indigenous authorities and a conflict resolution process between members of the different communities affected by such divisions. On the Caribbean area of Nicaragua, the Indigenous peoples have also achieved the preservation of their traditions, culture, mother tongue and antique social structures. Nowadays, the indigenous communities of Miskitus, Mayagnas or Sumus prevail. Sumus are gathered in three social linguistic groups: The Twhaskas, Panamakas and the Ulwas. The Rama are the third Indigenous Community of the Caribbean and only inhabit in the South Atlantic area of the country. The Rama are composed by 9 communities: Rama Cay, Sumu Kaat, Tiktik Kaany, Wiring Cay, Monkey Point, Bangkukuk, Corn River, Indian River and Greytown. This Indigenous community features communal authorities charged of the commune management. The traditional governments which represent the community are elected according to their customs and ancestral traditions. Julio César Ruiz, Coordinador Componente de Áreas Protegidas del Gobierno Rama-Kriol (Coordinator part of the protected areas of the Rama and Kriol government) in 2013, explained that territorial authorities are also established and are considered as the administrative head of the lands legally represented by themselves. Julio César also remarked the principal problems of the communities. Social changes and transculturation have created the loss of the Rama language. In this moment, exist approximately 10 elders speakers of the Rama language. Projects of language revival and promotions of the ecological tourism initiatives have been created to counter the existent problems. Some activities performed through this project are constructions of lodgings in the communities to receive national and foreign tourists, who are willing to learn from the Rama culture in order to reinforce and boost the members of the community to rescue their own culture. The Miskitu or Miskitos communities are located in the Autonomous Regions of the Caribbean Coast of Nicaragua. According to Melvin James Morton, Miskito leader and professor of the Bluefields Indian and Caribbean University; diverse theories raise that the origin of this community began with migrations from South America about 6,000 years ago. Another contemporary explanation indicates that the origins are a mixed between African slaves with the former native peoples of this Caribbean area in the year 1,600. In Nicaragua exists three variants of the Mískitu community: the Wangki who inhabit the Coco river area; the Táwira, located in the North plains, South plains, Northern coast and Southern coast of the RAAN; and the Baldams, located in the Pearl Lagoon basin and in the mouth of the Río Grande of Matagalpa (RAAS). However, due to intern migrations, a considerable population of the Miskito community inhabits in Corn Island and Bluefields. Melvin James explains that a reliable population census of the Miskitu community does not exists. Nevertheless, with the census carried out by the government in 2005 is believed that there are approximately 300,000 Mískitus inhabitants. The language spoken by these people is known as Miskitu. Nowadays, is under threat due to the preferences of new generations to speak in English or Spanish. Thanks to the support of the external cooperation of the Embassy of Finland and Denmark, many communities of RAAN and RAAS are enforcing intercultural-bilingual education systems in kindergarden and elementary school as part of a language revitalization plan. Within the remaining traditions of these peoples are included proper authorities which are governed by an internal normative of each community. In such authority composition stands out the Wihta (judge), who interferes to resolve conflicts of minor scales and mediate between all parties concerned. Its influence allows him to dictum sentences verdicts to punish or establish fines and imprison for any crime committed. The trustee is part of the communal ancestral government. It is the person in charge to look over the territory and nature resources of the community or region. Also, is the responsible to allow explorations or lease the goods of the community with the acceptance of the Communal Assembly. Finally, but not least important, is the Elders Council. This structure is integrated by the most notorious elders of the community who inspect the performance of other authorities. The elders have many influence and authority for suspend or dismiss of charges the communal authorities. Acording to Lusbin Taylor Pikitle, General Secretary of the Asociación de Estudiantes Universitarios Mayagna de Nicaragua AEUMNIC (Mayagna University Students Association of Nicaragua AEUMNIC), the Mayagnas Indigenous community maintains an organizational structure that allow them to keep their customs and traditions. These peoples are organized in communal and territorial levels. Among them stand out the Elders Council, the Trustee (group of leaders in charge of the land administration), the Wisyang (Communal and territorial judge), rangers, territorial leaders, territorial governments and the Mayagna Nation, before known as Sukawala, maximum organization of the Mayagna community. 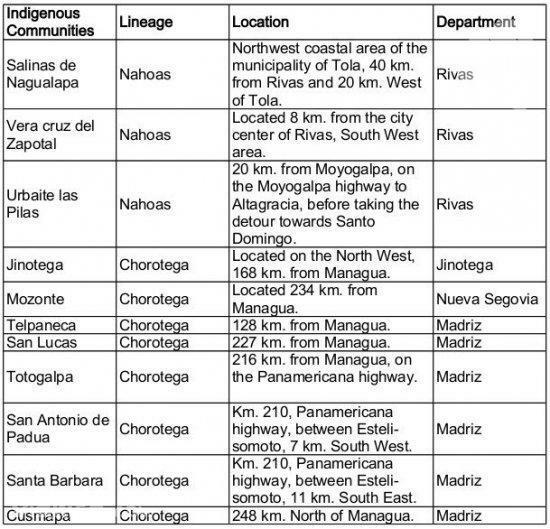 On the following table provided by Lubsin Tayler, is summarized in a general way the information about the Mayagna communities. The table shown is a result of the Mayagna government work, accomplished on 2011. Taylor also explained that within the Bosawás Biosphere Reserve, considered the lung of Central America, are found the Mayanga communities Sauni as, Mayagna Sauni Bu, Mayagna Sauni Bas, Mayagna Sauni Arungka, Lakus, Umra and Pyu and Amarana. These communes deal with illegal timber extraction, colonos invasion and the continued advance of the agricultural frontier. Today, each commune has managed to preserve many of their customs inherited from generation to generation, known as customary law , informed the coordinator of the Indigenous People Council of the Pacific Center and North of Nicaragua, Justo Felipe Ruiz. In addition, Ruiz declared that the council is currently working to reinforce the indigenous leaders work and the application of agreements, which improved the understanding of their culture and ancestral knowledge. Ruiz refers to the Agreement No. 169 that Nicaragua approved through the National Assembly, on May 6, 2010. The ratification was made in order to recognize the aspirations of the native communities to take control of their own institutions and lifestyles, as well as the respect to their culture and economic development. Another legal instrument the communities have, is the Declaration of the United Nations on the Rights of the Indigenous Communities, validated by the State of Nicaragua in 2007. With this declaration, the indigenous people of the Pacific, North and Center of the country can demand to the legislators better judicial procedures and laws specifically established for the communities of these areas. Authority elections in every community is a clear example of customary law. In the Caribbean area, the election of a trustee (Represents the peoples interest regarding on nature resources) keeps in his power the royal titles, documents and community seals. Likewise, in the Pacific region, the Nancimí select their Elders Council perpetually. The Elders Council work along with the directive board of the community, which are elected only for a period of time and are in charge of managing communal lands. According to Javier Mendoza, Communication Responsible of the Indigenous Communities Council of the Pacific Center and North of Nicaragua, the struggle for the revindication of the indigenous communities rights and the recognition for its authorities has been tough, however results can be appreciated. The inscriptions for all the Elders Council, Vara Mayors and Directive Boards of the Indigenous communities of the Pacific, Center and North of the country has begun. The goal is to obtain the recognition of the State of Nicaragua. The theme 'Existing Indigenous Communities of Nicaragua’ was developed by the social communicator Arquimedes Hernández Martínez, journalist of ViaNica.com in October 2013. Declaration of the United Nations on the Rights of the Indigenous Communities: consult. Consejo Nacional de Pueblos Indígenas Pacífico Centro y Norte de Nicaragua. Estudio de base sobre las condiciones de vida de los pueblos indígenas del Pacífico, Norte y Centro de Nicaragua de la Oficina Internacional del Trabajo (OIT): consult. Lusbin Taylor Pikitle, Secretario General de la Asociación de Estudiantes Universitarios Mayagna de Nicaragua (AEUMNIC). VIII Censo de Población en Nicaragua, realizado en el 2005 por el Instituto Nacional de Estadísticas y Censos: consult.